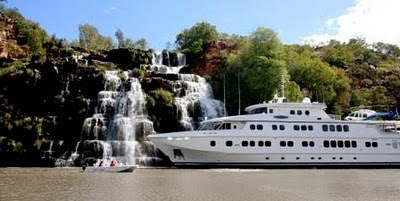 The crew of the adventure-cruise ship TRUE NORTH is sailing into the ultimate Kimberley waterfall season. The Kimberley has enjoyed a record breaking wet season with Kuri Bay recording 1395 millimetres in a month, the highest monthly rainfall recorded in Western Australia. Crew-members aboard the mighty TRUE NORTH have confirmed that the ‘waterfall season’ is living up to its name. Anyone who has travelled aboard the TRUE NORTH during the waterfall season will tell you there’s nothing better than seeing the Kimberley coast in all its glory. The period immediately following the wet season presents the best opportunity to see iconic features such as Kings Cascade, Mitchell Falls and the King George Falls at their thundering best. The whole region is transformed by rivers in flood, towering waterfalls and an abundance of wildlife. Billabongs are swollen, immense wetlands are alive with birdlife and the barramundi will be biting! Guests on the TRUE NORTH enjoy unique daily experiences including helicopter flights to remote and otherwise inaccessible locations. The multi-award winning adventure-cruise ship, True North, allows discerning guests to experience wilderness in surroundings more akin to one of the world’s most exclusive hotels. * A sundeck, forward observation lounge, ship’s lounge, alfresco bar, internet café, plasma screens with interpretive information, lower deck dining room with large panoramic windows, and fine dining. * Multiple expedition boats (6) allow passengers greater opportunity to do “what they want, when they want”. * To add another dimension to adventure – most cruise options feature an onboard helicopter.